Home » Blog » Meet Kasandra Griffin, Our New Executive Director! Meet Kasandra Griffin, Our New Executive Director! After a thoughtful and deliberative process involving representatives of our board, staff, and partner organizations, we are delighted to welcome our new Executive Director, Kasandra Griffin. In order to get to know her a bit better, we asked her to tell us about herself! 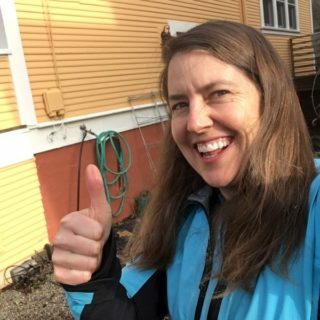 Why did you choose to join the Community Cycling Center as its next Executive Director? I am joining the Community Cycling Center because it’s an amazing organization where I can combine my love for bikes with my passion for equity, and where the work is about both systems change and individual empowerment. I am a lifelong bicycle commuter and a huge fan of the transformational power of bikes – for individuals and also for communities. I previously spent eight years on the staff and board of the BTA (now The Street Trust), including as Board Chair, Interim Executive Director, and Director of Finance and Development. While it has been a few years since my day job has been about bikes, my love for them has never waned. My current volunteer passion is Depave, where I am a co-founder and a board member. Depave works with willing landowners – often faith communities and schools – to remove asphalt (by hand, with volunteers), and replace it with gardens, playgrounds, and natural plantings. Like the Cycling Center, Depave’s work supports people coming together for individual empowerment through physical activity (in that case, smashing asphalt!) and for community improvement, which I believe is a strong recipe for success. Coming back to an organization centered on bikes feels like returning to my first true love. Doing it at an organization that is also focused on equity makes me feel honored, delighted, and eager to get to work. You can expect an enthusiastic manager who wants to work collaboratively to ensure that this beloved and effective organization continues to thrive. My initial goals are to increase financial reserves and raise staff wages, so that our excellent staff can afford to keep working here, and our operations will better align with our values of diversity, equity, and inclusion. Overall, I hope to support and strengthen the things that the Cycling Center is already known for: distributing free bikes to young children, teaching youth about bike safety and bike mechanics, engaging hundreds of volunteers for thousands of hours per year, operating a fabulous shop, and using bikes to empower individuals and build community. In the longer term, if there are some big new projects that emerge during my tenure, they will have come up through staff, or board members, or community and partner organizations, rather than springing out of my own head fully formed. My favorite place to ride is wherever I need to go. I have been known to go on pleasure rides and long distance bike tours, but mostly I use my bike as functional everyday transportation. Whether it’s just down the street or across town, I love getting some fresh air and moving my body as part of my commute, my errands, and my other activities. That said… the Strawberry Century, organized by the Santiam Spokes bike club, is my favorite organized recreational ride. It is a lovely route around the rivers, hills, lakes, and farms of Linn County, starting in Lebanon, Oregon. I have a dream for this region to live up to its hype! Many white people like to think of Portland and Oregon as progressive, but really the city and state have an incredibly racist past, which leads to a racist present. I want the community to not just be the kind of progressive that votes to expand the bottle bill, but also the kind of progressive that shuts down the white supremacist organizations in our midst instead of providing free bus service for hate marches. I ride an early steel Trek touring bike. I bought it from Erik Tonkin at Sellwood Cycle Repair in August of 2000, in order to ride Cycle Oregon that year, because the then-E.D. of the Cycling Center gave me a free entry! Kasandra officially starts Monday, June 12th, but feel free to welcome her in the comments below!